Yes, yes, yes -- amen. 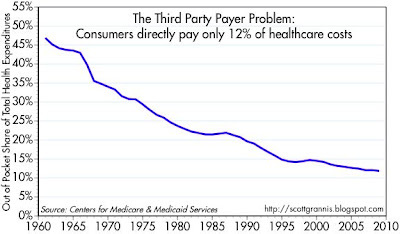 Any genuine health care reform has to include elimination of the tax preference as its centerpiece. Our country needs to flat out rewrite the tax code in simple + plain language. Flat + lower rates, no deductions, and call it a day. It would unleash massive amounts of capital and entrepreneurial spirit. Your post is misleading. 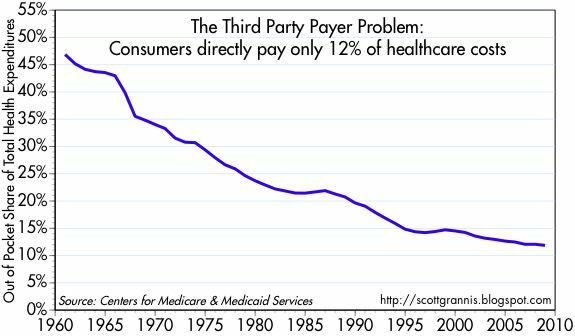 The percentage of out-of-pocket payment has diminished as health care costs have skyrocketed and wages have remained flat. Plus, we pay for insurance. It's not a handout from a third party. Doctors didn't make a lot of money until insurance came along.